The Playback Device tab provides options to let you select your audio output device, specify the audio technology, and adjust the speaker gains. In the Device Selection drop-down box, choose an audio output device. Headphones if you are using headphones through a headphone jack. Speakers (number of speakers is automatically detected) if you are listening to the movie through speakers. S/PDIF out if you are connecting your audio output to a receiver which supports Dolby or DTS audio technology. The Speaker control area displays the location of the speakers or headphones as selected from Device Selection. Use the sliders next to the respective speakers to adjust the gain for each speaker. Click the box above the gain slider to adjust the time delay for each speaker. Click the box below the gain slider to reset the gain for each speaker. Depending on the selected audio output device, different sets of options will appear in the Technology drop-down menu. Specify the filtering and noise reduction technology to be used for the audio. Stereo: Plays video or audio files in stereo sound. Dolby Headphone: Plays crisp virtual audio through Dolby Virtual Speaker technology. Dolby Virtual Speakers provides audio virtualization for two-channel speaker configuration and creates realistic surround sound from those two speakers. Adjust the Room size slider to specify the coverage area for the virtual speakers. 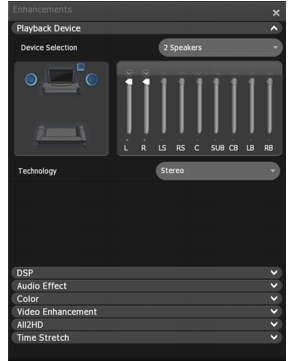 Check the Dolby Pro Logic IIx checkbox to enable this feature and expand existing stereo- or 5.1-channel audio to 6.1 or 7.1-channel audio playback. Choose Movie Mode or Music Mode from the drop-down menu, depending on what is currently being played. SRS dialog clarity: Dialog in cinema soundtracks can sometimes be difficult to understand due to background noise, inadequate speakers, or poor audio mixing. SRS dialog clarity provides you with the power to bring crisp, clear dialog from your playback material. Adjust the slider to get maximum clarity. SRS trubass: Modern film soundtracks have a lot of deep bass information in them. SRS trubass enhances movie playback by delivering the bass sound of a subwoofer to small speakers and headphones. It also enhances the capabilities of low-range speakers if you already have a subwoofer. Adjust the trubass slider to enjoy richer, theater-like bass sound. Corel Headphone: Optimizes your audio settings using Corel’s technology. Dolby Virtual Speaker: Dolby Virtual Speakers provides audio virtualization for two-channel speaker configuration and creates realistic surround sound from those two speakers. Choose from Reference, Wide 1, and Wide 2 to specify the coverage area for the virtual speakers. Dolby Pro Logic IIx: Expands existing stereo- or 5.1-channel audio to 6.1 or 7.1-channel audio playback. In a addition to the 5.1-channel Dolby II output, Dolby IIx generates back right and back left channel outputs to provide you with a true surround sound experience. SRS XT: Provides the same SRS technology in the SRS Headphones option for your current speaker setup.